We ate out a lot when I was growing up, and restaurant food is still one of my great pleasures in life. It's also become one of my biggest contradictions. I devote a lot of time to growing my own food, after all, and living frugally is something I aspire to, so why would I go out to dine on expensive food that was probably factory farmed thousands of miles from here? It's definitely nice to have someone else clean up the cooking mess, that's part of it. And some restaurant dishes are so complicated that you really can't whip it up on a weeknight at home. 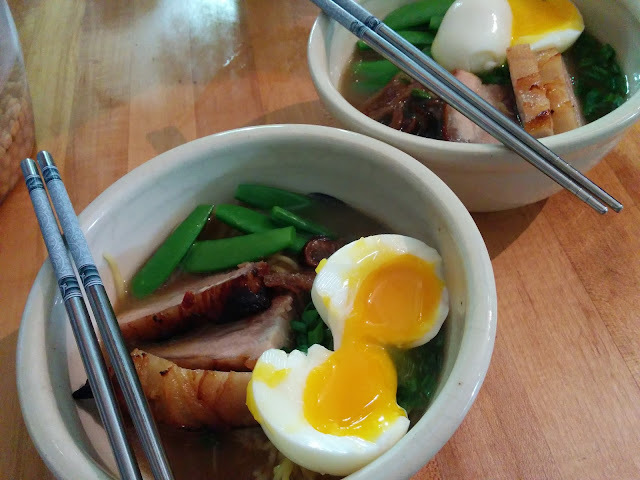 In my quest for a more homegrown, frugal existence, learning to prepare my favorite restaurant dishes at home has been an important piece of the puzzle. And a puzzle it definitely is. There's the recipe research, the reverse-engineering, figuring out how to cook things that require equipment we don't have in our home kitchen. When all of that effort pays off, and we get to sit down to a restaurant-quality meal we grew and made ourselves, oh man. It's the best feeling. 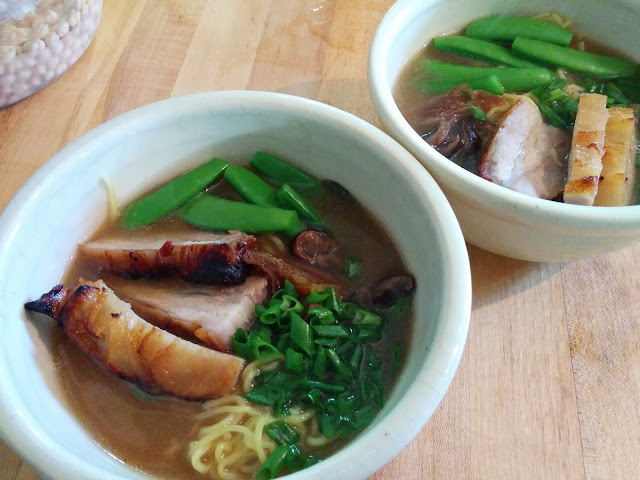 Is making ramen at home a lot of work? Absolutely. But the great thing about it is that it actually comes together pretty quickly once you've made all the pieces. I made the broth a month or two ago and froze it. The pork belly can be easily frozen as well, and pickled veggies will keep for quite awhile in the fridge. So I make the components here and there when I have time, and then I can whip up a killer meal in 20 minutes or less. 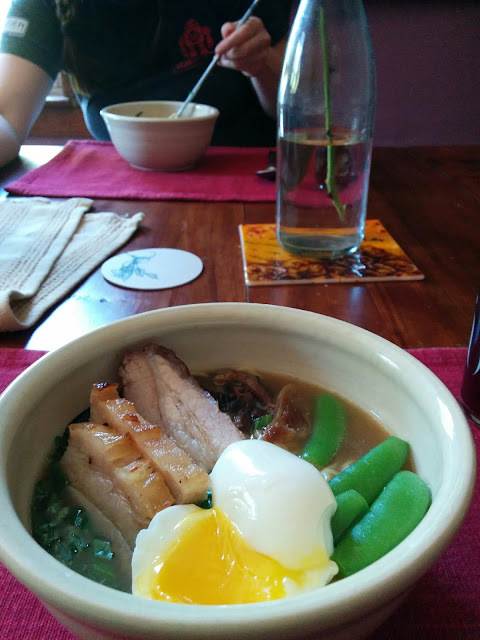 I made this bowl of ramen with pork bones and belly from a local hog, eggs, peas and scallions from the yard, and home-pickled shiitakes from a local mushroom farm. 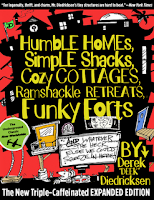 Everything came from within a 50 mile radius, except for the noodles (next time!) and soy sauce. The total cost of the ingredients per serving has got to be under $5. Do you like to cook your favorite restaurant meals at home? What dishes have you perfected, and what do you want to try next? Breakfast salad is one of my favorite ways to start the day. 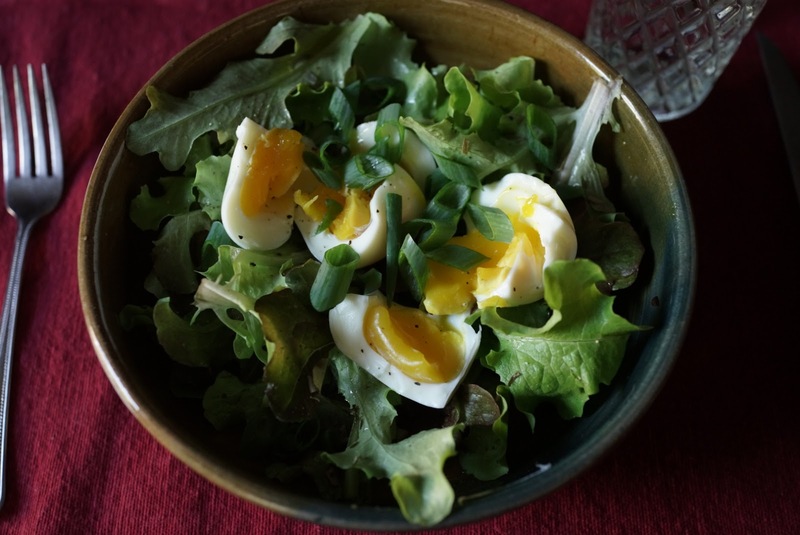 Soft boiled eggs, from our chickens, top this luscious bed of greens from the garden. A sprinkle of tarragon and a white wine vinaigrette add an aromatic flair reminiscent of Béarnaise sauce. It's the first of June in New England. This salad's lettuce harvest came from our winter garden, which left us a lettuce patch this spring that's still going strong. Soon the lettuce will bolt. In anticipation we planted a new row of lettuce seed a couple weeks ago. The green onions were picked from the storing onions in the annual garden. Our walking onions are getting too fibrous to eat now. Fresh eggs resist peeling. Older eggs peel like a dream. If you love hard boiled eggs like us, backyard chickens present a challenge. We set some eggs aside in the fridge to age them for hard boiling later. 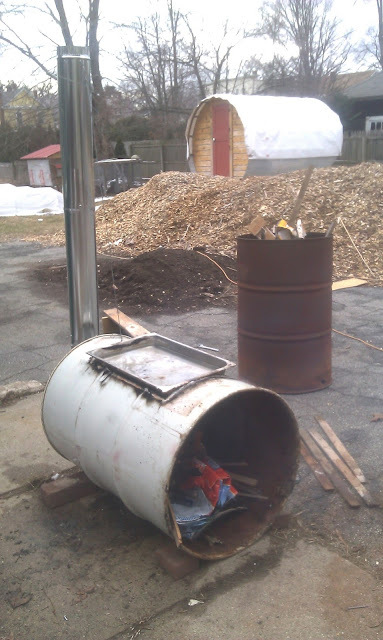 We made a simple evaporator using a 55-gallon drum, some pipe, and a chafing dish. Building this did require one special tool; an oxyacetylene torch, which we borrowed from a friend. This year's mild winter has made for a pretty bad sugaring season, but great weather for finally building an evaporator. Usually there's way too much snow cover to get this kind of project done. We only have a handful of taps, so one tray is plenty for us, but you could get more out of one barrel by fitting two trays side-by-side. So, what are we tapping? We have two silver maples and one sugar maple on our property, and a total of 5 taps. 5 gallons of sap makes about a pint of syrup, so that's our minimum batch. In a good year, we can make about a gallon, which is plenty for our household. It remains to be seen how many more runs we'll get this season. 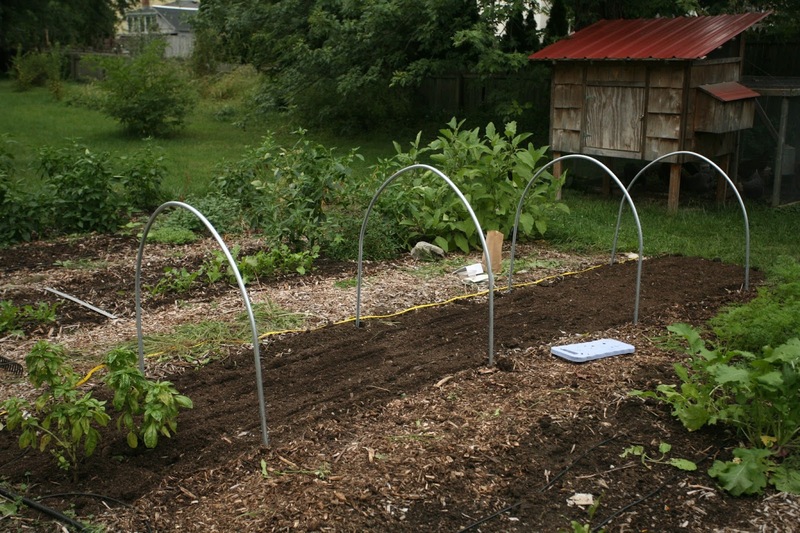 Back in the Fall, I showed you our new winter gardening system, a series of four low tunnels. In these new winter beds we planted leaf lettuce, spinach, spicy greens, bok choi, kale, onions, carrots, turnips, cilantro, and parsley. On this last day of February, everything is still alive, having survived several nights near -10 Fahrenheit. Our harvest totals more than 20 pounds of food collected during the coldest months of the year. We washed all this goodness down with homebrewed apple cider. Ah December, month of holiday craziness. We were able to bring a giant salad and deviled homegrown eggs to my grandmother's for Christmas dinner, and we enjoyed latkes made from our own potatoes at Chanukah. We also started drinking the hard cider we made back in the Fall; giving us a special treat to bring to holiday gatherings. Come January we were still regularly enjoying smoothies made from our own frozen strawberries and blackberries, chiles rellenos with homegrown green chiles, salads, and tomato sauce we canned in August. Now in February, we've run out of tomato sauce (but we still have some salsa and tomato juice), and the squash and potatoes are gone, but we still have some fruit in the freezer and plenty of green chile. 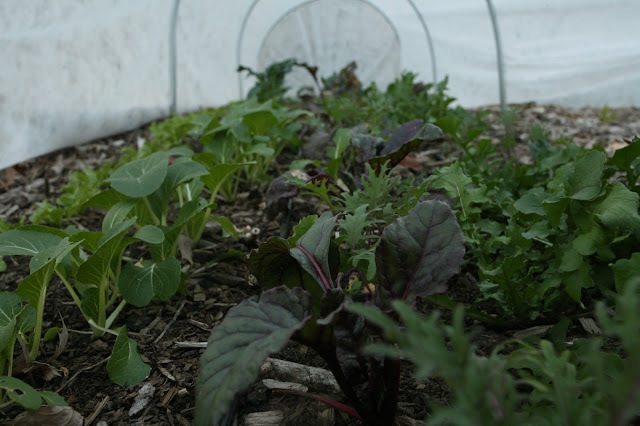 We've got carrots and turnips in the fridge, and until this week our low tunnels were cranking out the greens. They survived two nights below -10, but our lettuce supply is largely depleted, so we are down to arugula and spinach for at least the next few weeks. Now that the days are longer, our chickens have started laying like crazy, and we are welcoming the return of backyard eggs to our diet. With Spring just three weeks away, this will be the first winter we've weathered with such a steady supply of homegrown food all the way through. Let me tell you, it feels amazing. If you live in the northeast, then you've probably already put your garden to bed for the season. If, like me, you can't bear to say goodbye to the supply of fresh veggies you enjoyed all summer long, I'm here to tell you: it doesn't have to end! There are lots of ways to extend your growing season if you live in a cold climate (we're in zone 5b or 6a, depending on who you ask). 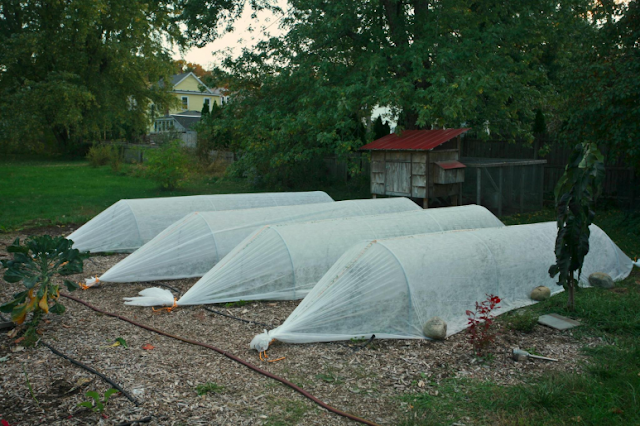 You can eke out a few extra weeks just by throwing a sheet over your crops when a light frost is predicted. You can keep some vegetables like carrots ready to harvest in the ground by covering them with a thick blanket of mulch. But if you really want to keep growing things like braising greens, salad greens, and herbs long into the winter, you're going to need either cold frames or low tunnels. Cold frames are familiar territory for most people. We've been using them for years, but I've been increasingly frustrated with them. They are labor intensive to build compared to the amount of veggies they hold. Worse, they are finicky--if you don't judiciously open them on warmer sunny days, your veggies will overheat and fry. If you open the cold frame but don't remember to close it by day's end? Buh-bye winter garden. This year, we decided to try out a different season extender; the low tunnel. Low tunnels look like miniature green houses. They are built out of some sort of flexible pipe (we used electrical conduit, or EMT) and covered with frost protecting row cover and/or greenhouse plastic. We built four 16' long low tunnels this year, at a cost of approximately $10/tunnel. We closely followed instructions from Johnny's Selected Seeds, with one major difference; we didn't use the hoop bender they sell. 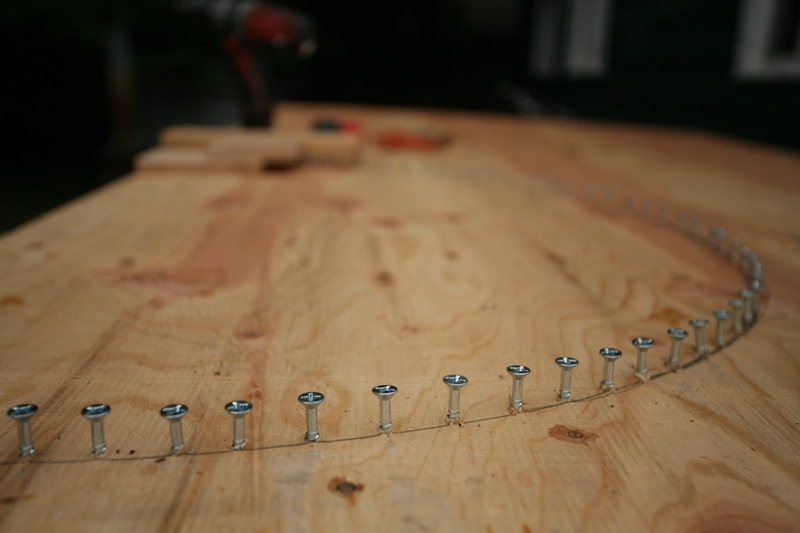 Instead, we made a jig using a quarter sheet of plywood and a lot of screws arranged in the arc of the hoop, as shown in this Instructable. If you want to enjoy fresh salads in the dead of winter, you have to plan ahead. Plants stop growing once the hours of daylight drop below 10. These dark months are called Persephone Days, and you can find out when yours begin here: http://aa.usno.navy.mil/data/docs/Dur_OneYear.php . For me, it's November 11th. You want to make sure your plants have reached harvesting size by this date; to do that, check your seed packets for "days til maturity" and count back from the beginning of your Persephone Days to determine the latest you can plant each crop. Alternatively, you can take advantage of the warm soil underneath your low tunnels to plant very late for an earlier crop in the Spring. So, you could plant spinach at Thanksgiving and expect to be harvesting it a few weeks earlier than normal in the Spring. Since your plants won't be growing during the winter, you need to have more plants in the ground than you would during the summer, so you can keep harvesting even though the leaves won't replenish. Seeing those vibrant greens chugging merrily along in the middle of a long cold winter can really keep the winter blues at bay, and so can all the nutrients in that fresh food! Do you have a winter garden? What works well for you? What hasn't worked so well?